This IBM® Redbooks® publication explains how IBM Cognos® Business Intelligence (BI) administrators, authors, modelers, and power users can use the dynamic query layer effectively. It provides guidance for determining which technology within the dynamic query layer can best satisfy your business requirements. Administrators can learn how to tune the query service effectively and preferred practices for managing their business intelligence content. This book includes information about metadata modeling of relational data sources with IBM Cognos Framework Manager. It includes considerations that can help you author high-performing applications that satisfy analytical requirements of users. 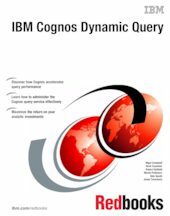 This book provides guidance for troubleshooting issues related to the dynamic query layer of Cognos BI.